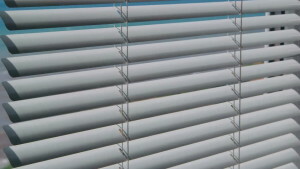 The special characteristics of the Blinds is how to open the lid vertically, up and down. If the Curtains are mostly made from fabric, then the material for blinds start from more diverse fabric, vinyl, wood, plastic, paper, etc. In the look of the Blinds are usually more impressed simple and neat, it also typically-shaped segments, although there is a kind of blinds that appears with an elegant impression. Here are some types of blinds. Austrian blinds made of fabric, curtains of this type appear with classic style, romantic and elegant. When opened up, the wrinkles will seem-wrinkles and folds of fabric in the shape of the arches. That’s why these blinds are suitable for stylish luxurious and elegant interior.